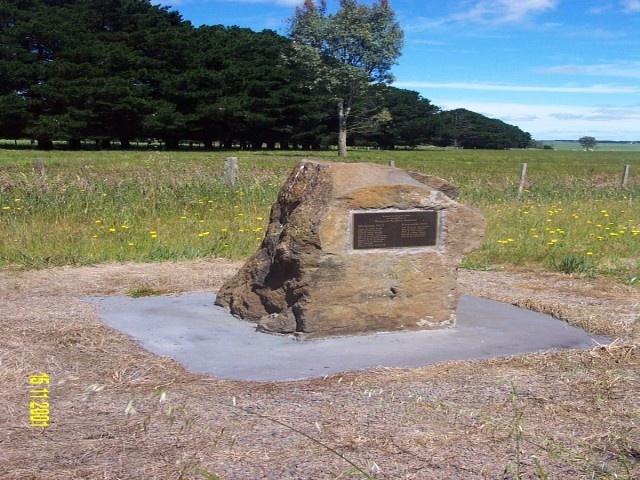 The Morgiana and Kinvonvie Soldier Settlement Memorial is located on the roadside reserve of Morgiana Road. The memorial is a large basalt boulder set in a concrete slab. A simple bronze plaque is set on the boulder, which details the names of those who first took up land under the World War Two Soldier Settlement Scheme on Kinvonvie and Morgiana Estates. The memorial was erected in 2002 and is in excellent condition. The Soldier Settlement Memorial is of historical and social significance to the Southern Grampians Shire. The Soldier Settlement Memorial is of historical significance for marking a major chapter in post World War 2 repatriation, commemoration and early posterity. It of further historical significance for its association with the returned servicemen and their families who took up land on the estates. The memorial is of social significance as a physical reminder of the change in the social structures which soldier settlement brought to the area, as well as many other communities in Victoria. The Soldier Settlement Memorial is located on the roadside reserve on Morgiana Road, Morgiana. The memorial takes the form of a large basalt rock, on which a simple bronze plaque is mounted. 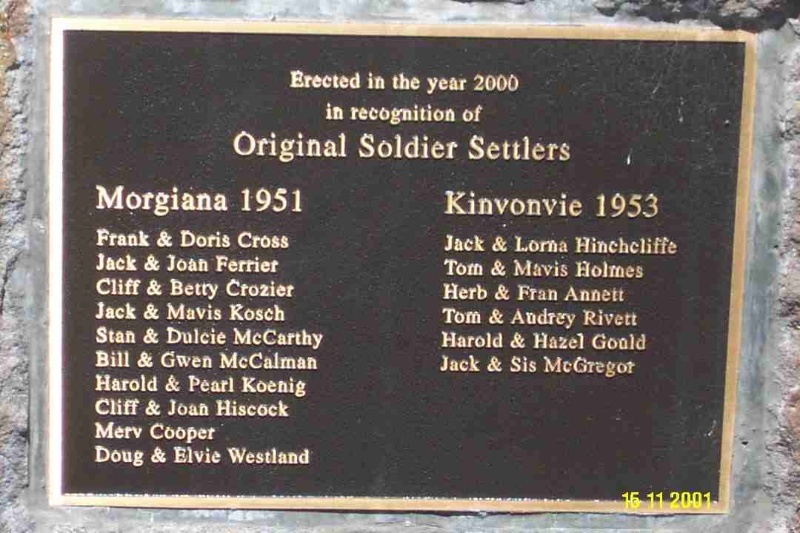 The plaque details the names of those soldiers and their wives who took up land in the district on the Morgiana Estate (1950) and the Kinvonvie Estate (1953) after returning home from World War Two. The memorial was erected in 2000 'in recognition of the original soldier settlers'. The memorial is set on a large rectangular concrete slab set in the natural grass of the roadside reserve. Highly intact, high degree of integrity.